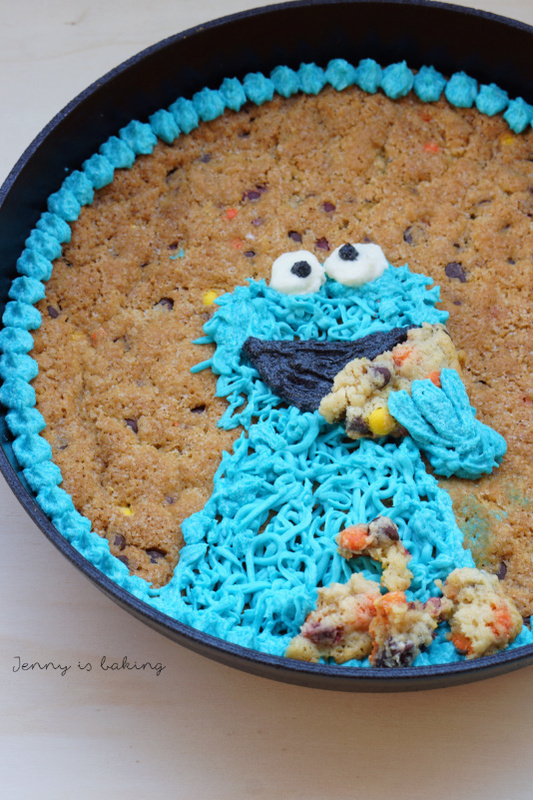 You don’t HAVE to make the cookie monster, but isn’t it just so adorable? If you don’t make the cookie monster on top with some buttercream, you will be done in a jiffy, I promise. Yes, this is comfort food and no, if you are counting calories, look elsewhere. But I am so grateful that I am recovering and that nothing worse happened. I am grateful that all the wounds in the face are healing, I am grateful that I didn’t break a single bone, and that I had many guardian angels protecting me when I crashed with my bike. Maybe you also feel like listening to the song while making the cookie cake. 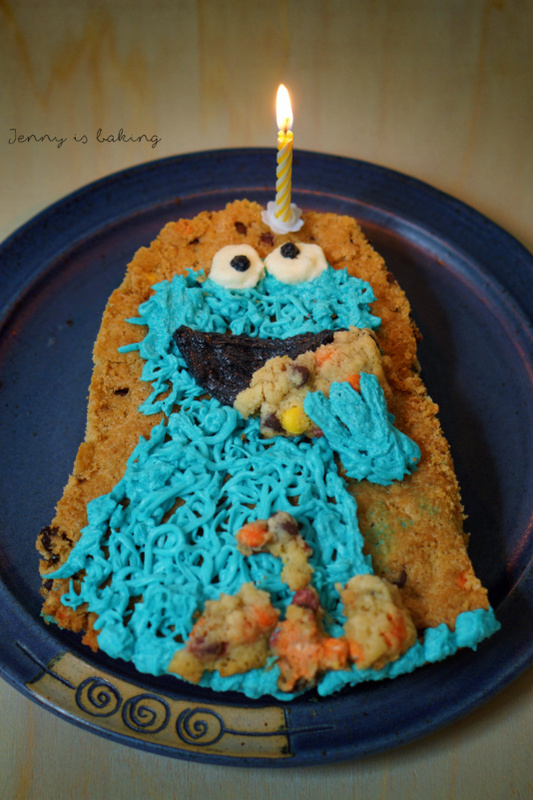 I also give some tips if you want to make the cookie monster with buttercream. I don’t own a grass tip, usually you would use that for the fur of the cookie monster. I just used a ziplog bag, pricking a few holes in one corner. Worked like a charm. For the cookie cake lightly crease a skillet that can be used in the oven. Mine has a diameter of 25cm. Heat oven to 180 degrees Celsius. Cream the butter for about a minute, then add the sugars. After creaming for another minute, add eggs and vanilla extract. Add flour, cornstarch, and baking soda and mix until combined. Fold in chocolate chips and M&Ms. Spread into prepared skillet, I patted down the dough with my hands, you can also use a spatula. 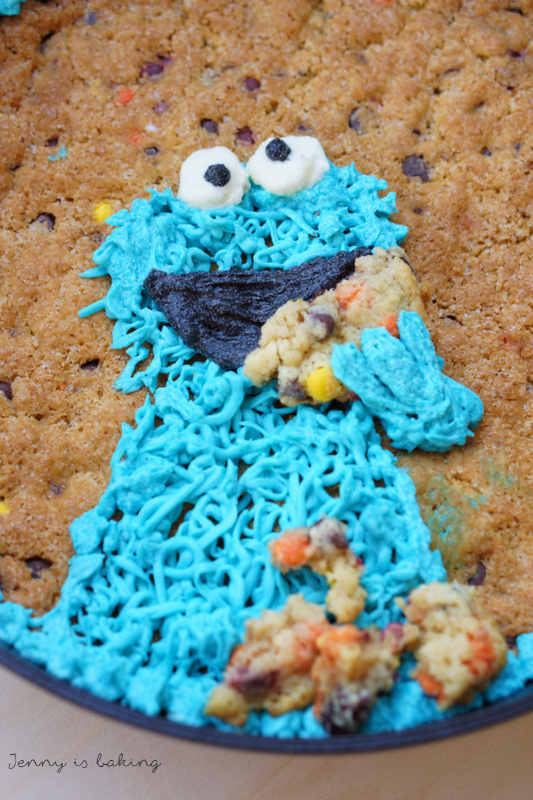 Reserve enough dough for at least one cookie if you make the cookie monster on top. Bake between 30-35min or until edges are crisp and lightly golden. If your skillet is considerably larger or smaller, adjust baking times. Bake the single cookie for about 8-10min or until edges are golden. Let cool. For the buttercream mix together flour, sugar and milk in a pot. Heat up while stirring and let boil for about two to three minutes. It should thicken considerably. Let cool. If not using shortly after, place plastic wrap directly on it. Should be kept at room temperature. Beat the butter for about five minutes or until lighter in color and add the cooled off flour, one tablespoon at a time. Once everything is combined, beat for another minute. Take away about four tablespoons for the black and white part, then add the blue food coloring to the rest and beat for another minute. Color the rest in black, you barely need any white, just for the eyes. I didn't have a grass tip, so I put about five holes the size of a toothpick into the corner of a ziplock bag and filled it with blue frosting. Start piping, first with the body of the cookie monster, then the head. Leave the hand for last, after having done the black and white parts. Break up the cookie, the cookie monster should keep a part in his hand, the rest should be somewhere at the bottom broken into pieces. Do the hand last, then pipe, if desired, a frame around the edges. I used a small M tip for that. Obviously you can also go for another ornament.